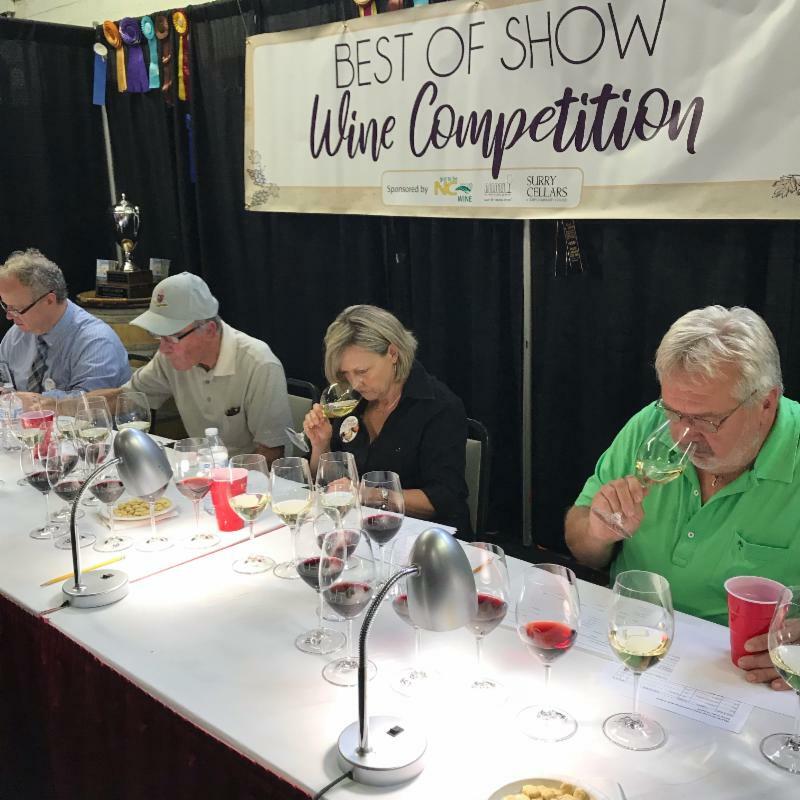 RALEIGH – Winners were announced in the 2018 N.C. State Fair Wine Competition following a live round of judging held Oct. 15 at the fair. Best of Show awards were given in three categories – Bunch Grape, Muscadine Grape, and Fruit and Honey. Jones von Drehle Vineyards in Thurmond earned Best of Show in the Bunch Grape category for its red wine blend “Steel and Stone.” Cypress Bend Vineyards in Wagram earned a Best of Show award in the Muscadine category for “Catherine,” a semi-sweet white Muscadine wine. Saint Paul Mountain Vineyards earned a Best of Show in the Fruit and Honey category for its blackberry wine “Home Place.” The Hendersonville-based vineyard won Best of Show in two categories in the 2017 competition. Robert Moncsko of Cary earned a Best of Show in the amateur competition for his merlot. The amateur competition and first round of judging in the professional competition were held earlier this summer at Surry Community College in Dobson. A total of 359 wines were entered in this year’s competition, including 292 professional and 67 amateur entries. Winners will be on display in the Education Building throughout the remainder of the fair. North Carolina wine also will be available for sample and purchase at the Got To Be NC Wine tasting area in the Hunt Horse Arena outside Gate 8. In addition, wine tastings also will be available inside the fairgrounds at the Our State Public House in Heritage Circle. North Carolina is home to nearly 200 wineries and more than 500 commercial grape growers. The wine and grape industry contributes $1.97 billion to the state’s economy. While North Carolina is known for its native Muscadine grape, it is now home to dozens of varieties of non-native, European-style grapes and hybrids that produce award-winning wines for every palate. More information about N.C. wine is available at www.ncwine.org.